As my friends cruelly continue to remind me, my country sadly didn’t qualify for the Russia edition of the FIFA World Cup. But who said that a World Cup without Italy can’t be fun? I don’t like gambling as in most cases the expected returns are negative. But last Thursday, armed with a $100 budget and the promise of some free bets, I decided to place a few wagers on some of the cup matches to alleviate the pain of not being able to support my team. One week has now passed. Here’s how it went. Opening an online account was easy. Probably too easy. And the number of ‘markets’ (events you can bet on) was mesmerising. Any football match has at least 120 events. While I was patiently reviewing all these options, one stood out. The broker was offering $15 for each dollar bet on Australia scoring a penalty against Denmark. Yes, I know Australia doesn't have a great football pedigree and Denmark isn’t a weak team, but an implied probability of less than 7% (one divided by 15) felt too low. Especially considering that in this World Cup, referees are allowed to use the Video Assistant Referee system (VAR) for the first time. This enables them to review a video replay before taking important decisions, such as giving a penalty kick. The VAR had already increased the likelihood of a penalty being awarded in a match. Before the Australia-Denmark game, after just 20 games, ten penalties had been awarded in the tournament compared to only 13 during the last 64-game edition. And so I bet. As you probably know by now, Australian captain Mile Jedinak scored a great penalty in that game. My bet paid out nicely. The day after I decided to investigate how big of a role luck played. After all, bookmakers are experts in setting odds and, as Italians know well, penalties can be missed (and saved). 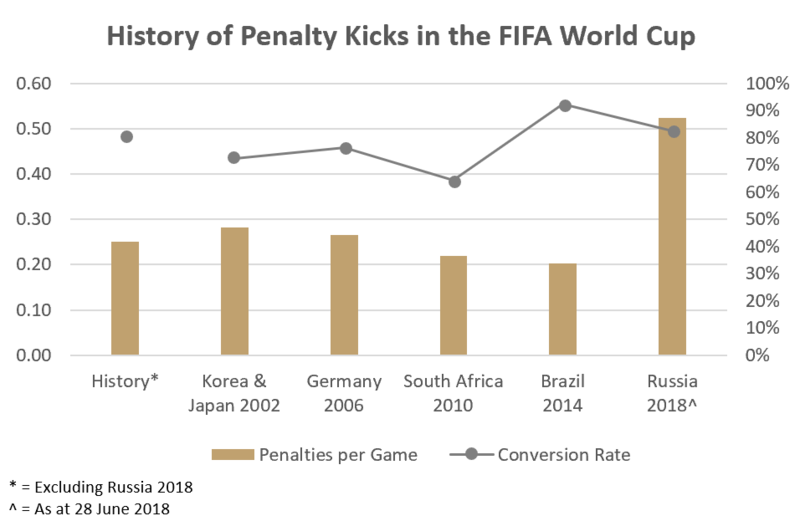 Excluding the current tournament, in the history of the World Cup, there have been 836 matches and about 210 penalties of which 170 resulted in goals. So, on average, there have been about 0.25 penalties per game with an 81% conversion rate. This implies average ‘fair’ odds of $4 for a penalty kick and $5 for a penalty goal (or implied probabilities of 25% and 20% respectively). These odds, after adjusting for a commission spread and some variability around the quality of each team, have been roughly matching my broker’s over the past week. This surprised me. After my first bet, as the Russian World Cup progressed, statistics have continued to support a 50% probability of a penalty in any given game and a 40% for a penalty goal. Suggesting ‘fair’ odds closer to $2 and $2.50 respectively for the two outcomes. In this light the broker’s odds continued to look good value and I have been betting more and more. So far this has proved quite successful. Perhaps this World Cup’s statistics will soon revert to the long term average and so it’s too early to claim that this has been a low risk way to make money. 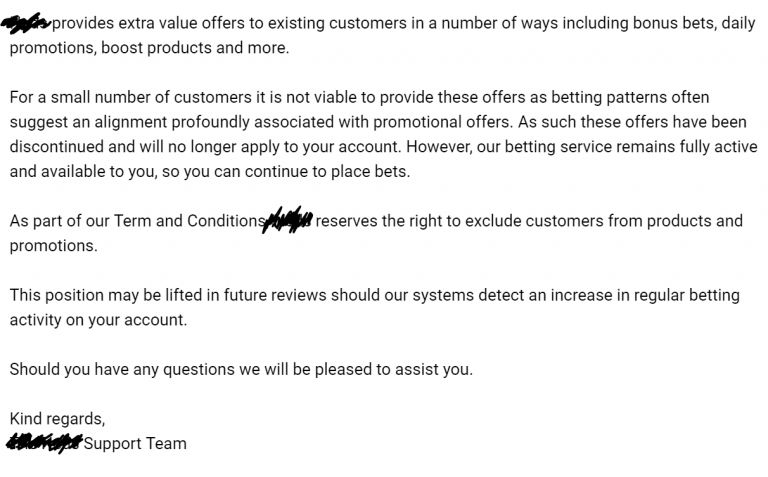 But an email this morning from my broker implying that my account is ‘under review’ suggests maybe the strategy has some merit. Nevertheless this experience reminded me of a few investing lessons worth rehashing. Making investing decisions based solely on past information is dangerous. Investors need to focus on the future profitability of companies as it's this that determines their values. Markets are mostly efficient, but from time to time mispricing can occur. Opportunities tend to exist around times of significant change. Like, for example, the introduction of the VAR system in the current World Cup. Stock prices often move up or down too much when new important information becomes available. As Philip Tetlock points out, frequent small changes to forecasts can help investors profit from mispricing. Low risk profit opportunities are rare. And when they come around, investors need to act swiftly as they don’t last long. My broker’s odds have already tightened. For example, the other night's odds on Australia scoring a penalty kick against Peru fell to $4 (a 25% implied probability). While this week was fun, my betting spree has come to an end. Trying to beat the stock market is already a hard job. Consistently winning against the bookies is even tougher.